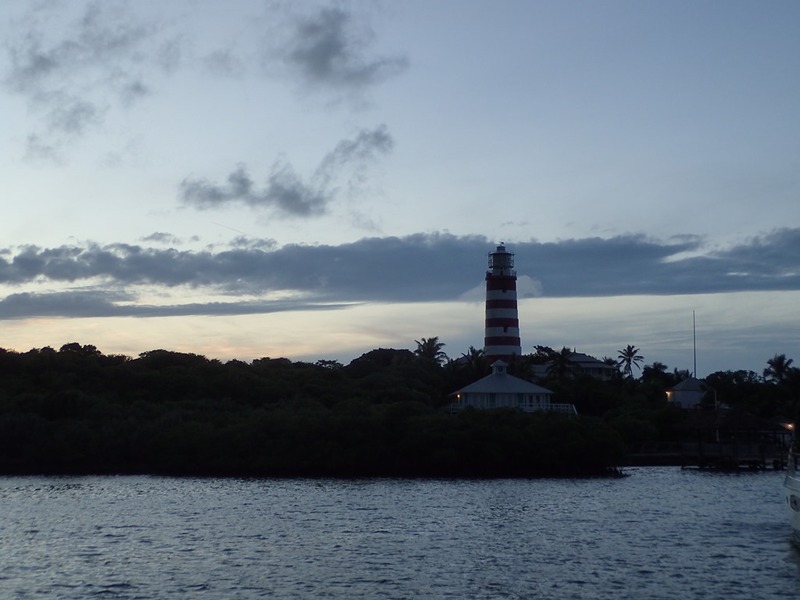 We’re back in Abaco, aboard Motu Iti. Yeah!!! We flew in from California, our new home. Yes, we moved cross-country over the summer. Why? It’s near our family, (primary reason), the ocean, and an adorable little town. And it’s beautiful. We think we’re going to love it there. 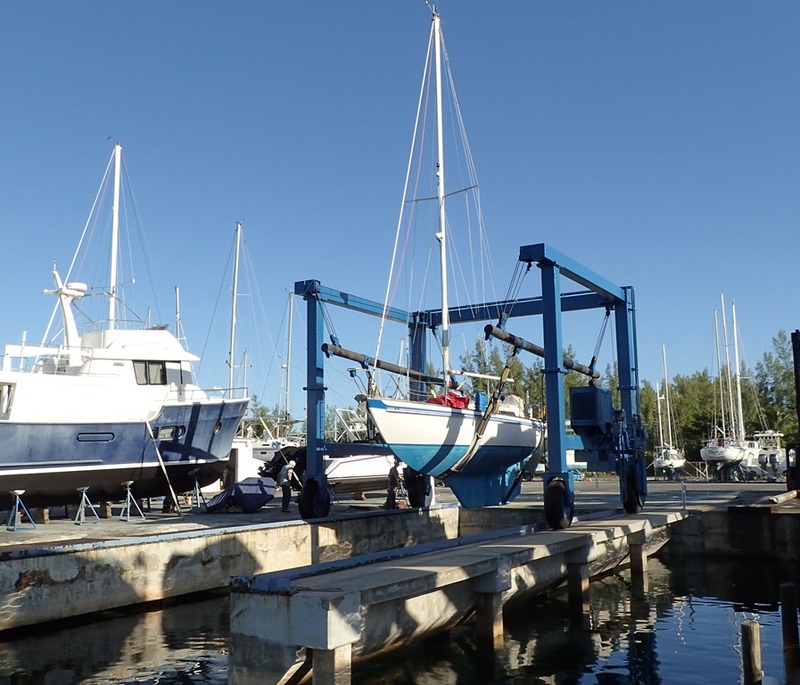 Just before Thanksgiving, we left all the moving boxes – unopened – in our little CA cottage, and flew to the Bahamas, joining Motu Iti at the Abaco Yacht Services boatyard in Green Turtle Cay. Here’s the view from our rental across Black Sound, looking at the boatyard. 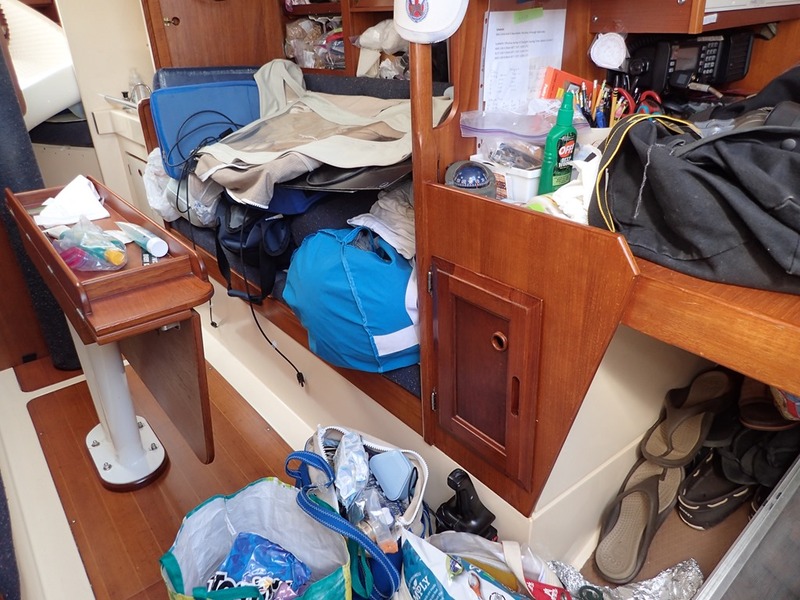 We brought bags of stuff – it all somehow melted into the boat. Motu Iti was in great condition – all that cleaning in the spring paid off! 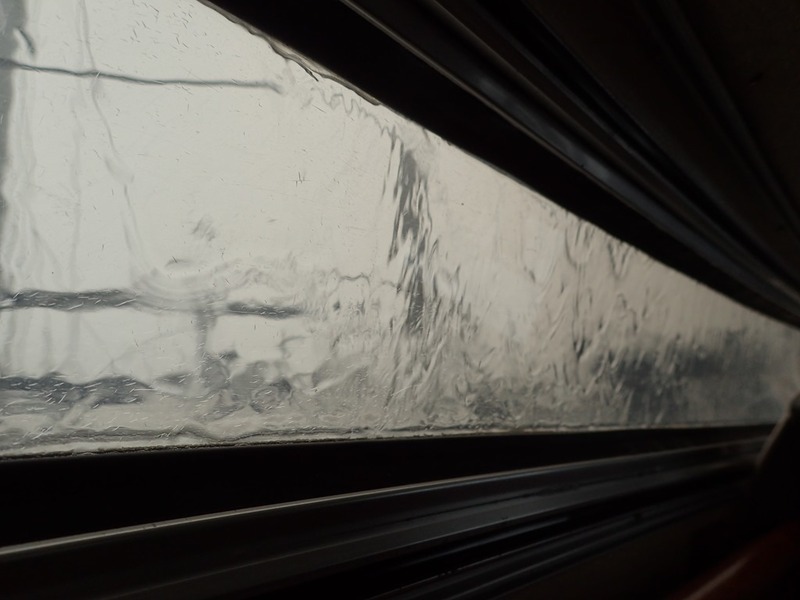 But launch day was slightly delayed due to heavy rain and squalls. Here was the view from inside our boat. We left the rental after three nights and spent the next two nights up on the hard, climbing a ladder to get aboard. 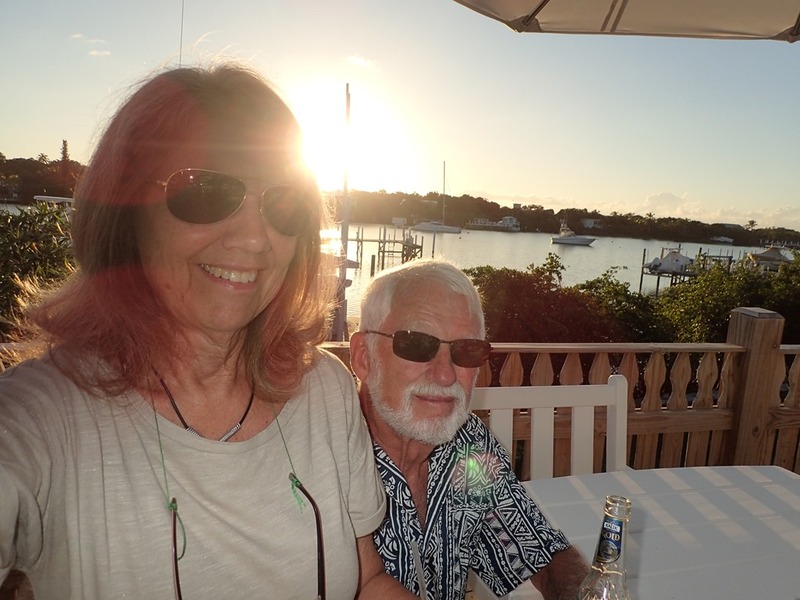 After putting on sails, inflating the dinghy, and generally making Motu Iti a sailboat again, we headed off for a well-deserved out-to-dinner celebration. 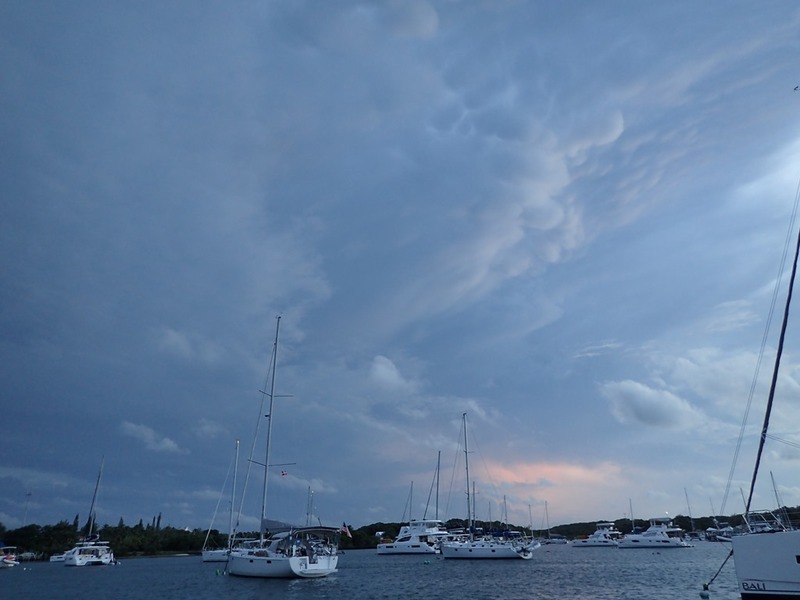 Early on Thanksgiving day, we left Green Turtle Cay – a motor boat ride due to light winds – and rocked and rolled our way around Whale Cay. 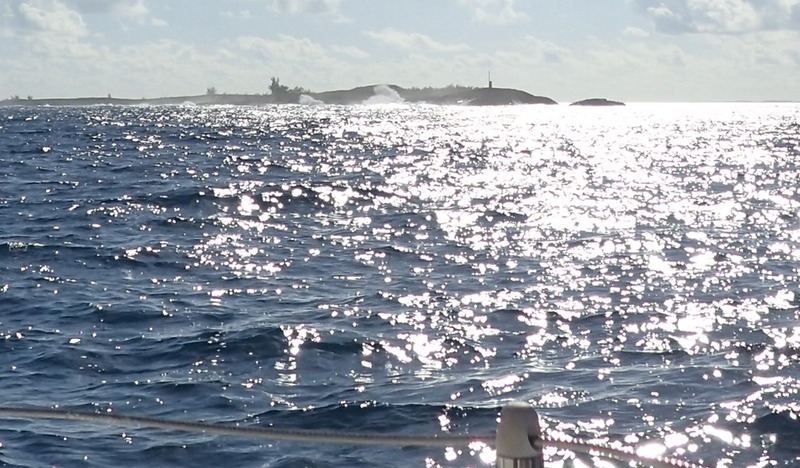 That’s Whale Cay, with 4’ rollers breaking on the ocean side. 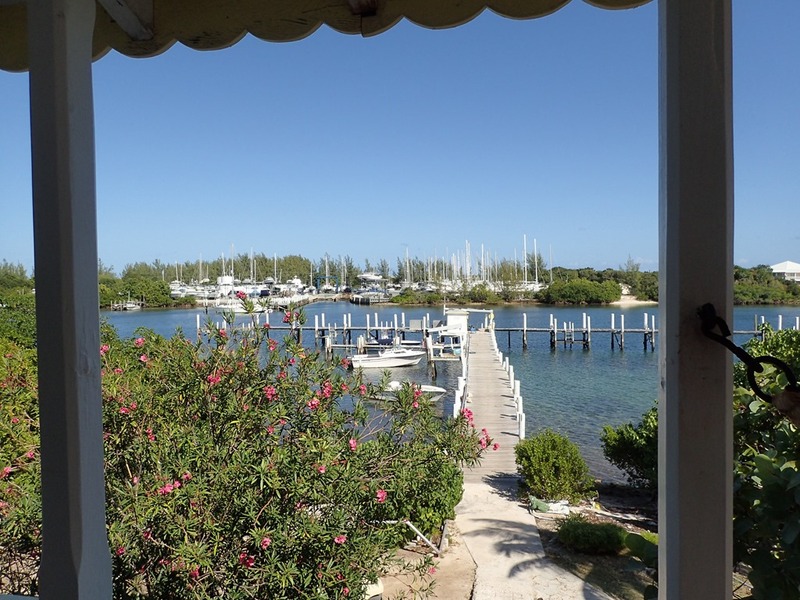 Due to shallows that extend across the Sea of Abaco in this area, we follow a route that takes us through a cut in the reef, out into the ocean around the north end of Whale Cay, and back into the Sea of Abaco through a cut at the south end of Whale Cay. 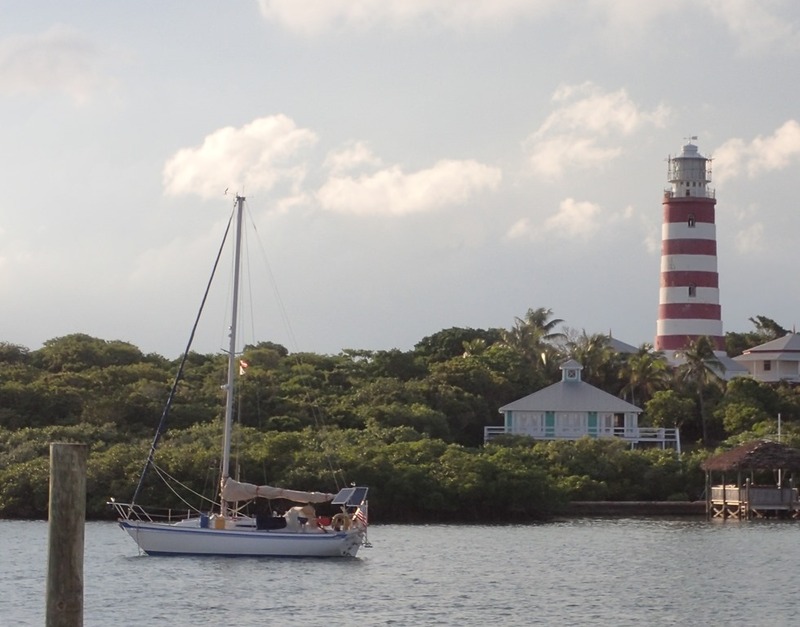 Since our prevailing winds are from the east, big rollers from the ocean fight their way through the cuts and onto the much shallower Sea of Abaco – so the ride around Whale Cay is always bumpy. This time the big rollers were far apart – meaning there weren’t as steep and were much more comfortable. The little red boat shows the actual location of our boat and the blue line is our route. 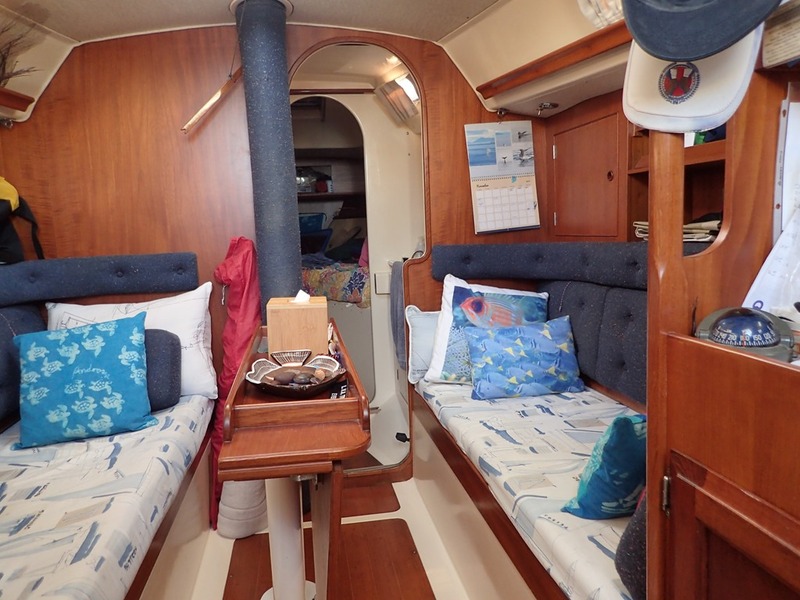 I plot several alternative routes – we choose which one to travel based on current conditions. 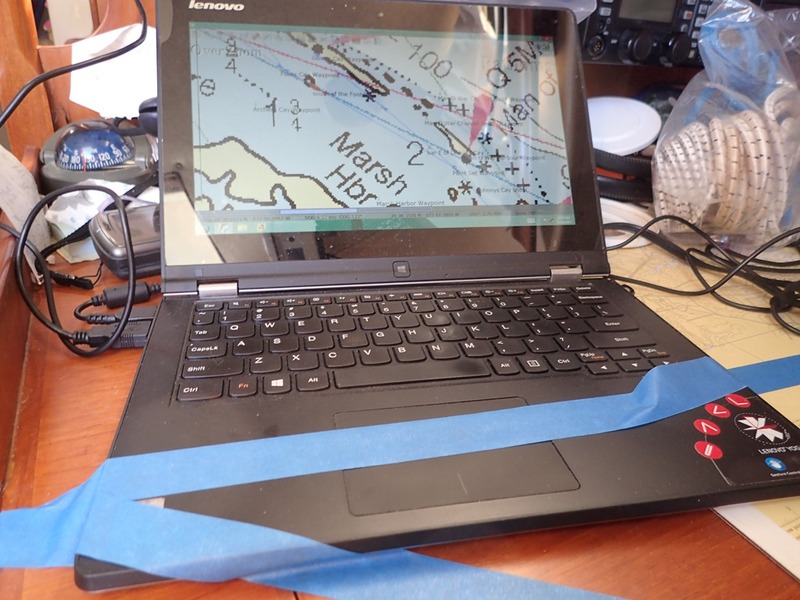 Prior to our passage, we input the latitude and longitude for a series of waypoints (specific locations we travel to and then make a course correction) that will take us around shallow spots, coralheads, and islands, and lead us to our destination. 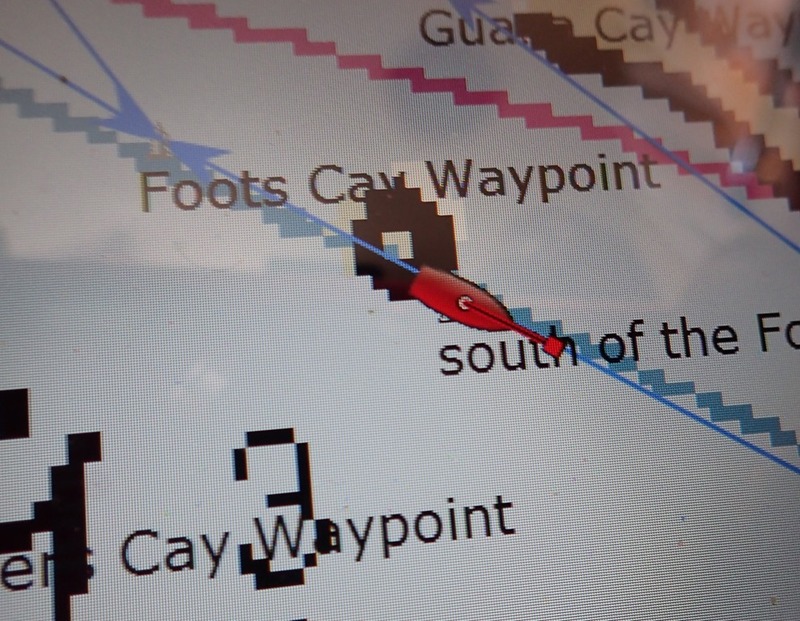 But once we clear the shallows of Foots Cay, we just point the boat at the Elbow Cay lighthouse in Hope Town and in a few hours, we’re at the harbor entrance. 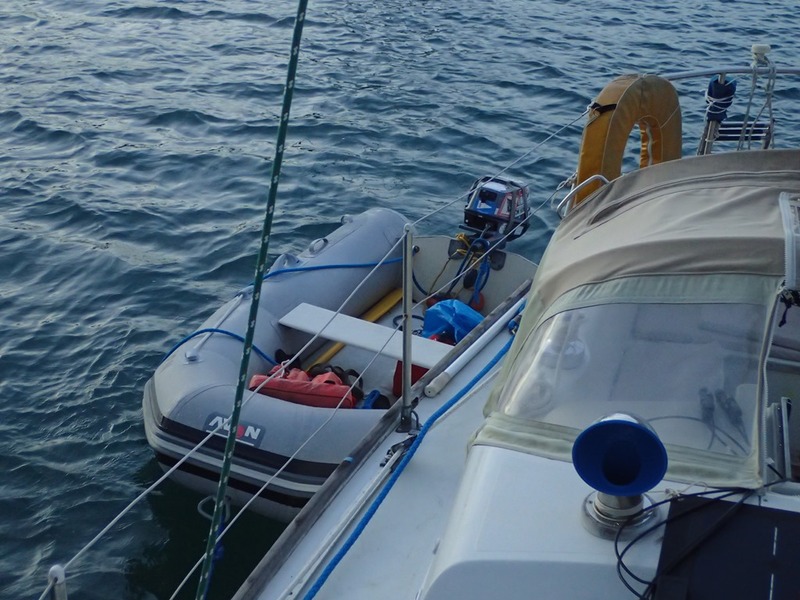 Once on a mooring, we launched the dinghy, (which we carry on deck for such passages), and headed for Cap’n Jack’s. Sure enough, we found friends there to have dinner with and catch up on the happenings of Hope Town. Then back to the boat – a long day. A beautiful sky develops as a front moves through, with wicked lightning storms north of us. Nice to be in the shadow of the lighthouse again. Welcome back. Here’s to a safe and healthy stay. We look forward to being entertained by your adventures. Glad you made it safely! Enjoy your winter! PS. Your haircuts look fab! I am so delighted that your adventures keep coming. Thanks for sharing and taking your readership on board with you. Good to hear from you. I sympathize with the boxes. Now living with Dan, Tarin and Madelyn.